The story begins with Epi-Paleolithic hunters developing a new awareness of their environment and its food resources, both plant and animal. 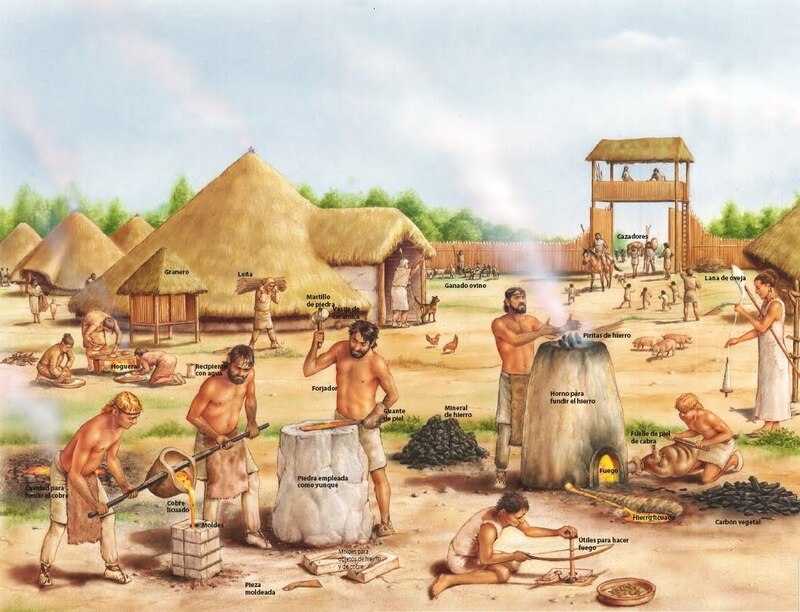 Even before the beginning of the Holocene, circa 8000 BC, some of these groups had started to experiment with the planting of crops – the first steps toward agriculture, and the domestication of some animals. The Neolithic, the period of early farming, had begun. Distinctive Upper Paleolithic stone industries of blade and burin type used by Homo sapiens for the manufacture of weapons as well as for various household objects in stone, bone, antler, wood and other perishable materials have been recognized in caves or open sites in various regions of the Near East. 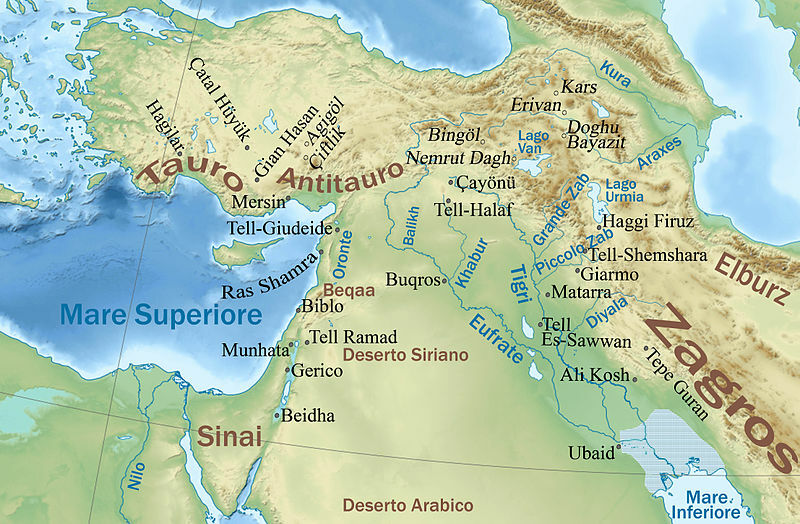 The two best known groups are the Levanto-Aurignacian (25,000 – 18,000 BC) in the Levant and the Baradostian (34,000 – 20,000 BC) of the Zagros Mountains of western Iran. Sites of this period can be divided into base camps, butchering places and intermediate camp sites of hunting bands where numbers were probably limited. Most of the large cave sites served as base camps; smaller shelters may have been used as intermediate sites, but butchering places are often out in the open, though the use of such sites may have varied from season to season. Of permanent occupation there is no trace, and these hunters were evidently migratory throughout the territories they occupied; each group may well have had several sets of caves at their disposal. Apart from similarities in tool types, there is little evidence to show contract and trade between the various groups at this period. The total number of individuals was probably limited and indeed burials are rare. No evidence for art has yet been discovered. 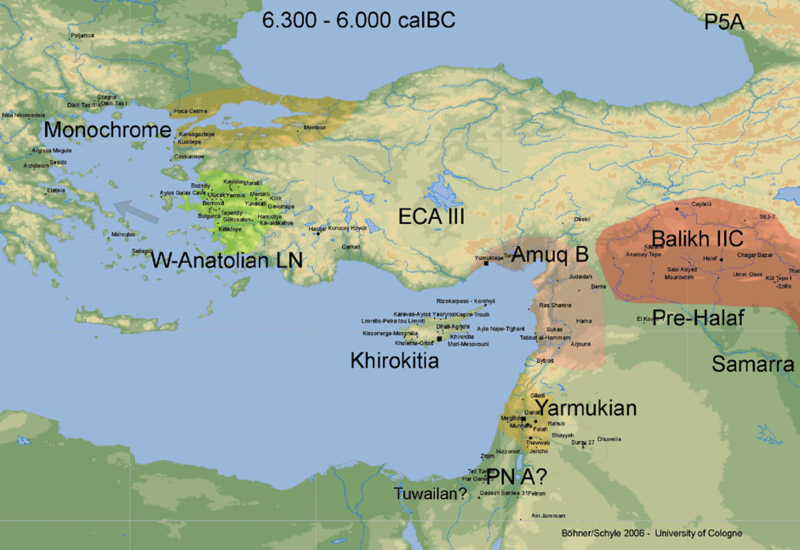 Some time between 20,000 and 16,000 BC the Upper Paleolithic gave rise to new cultures, collectively called Epi-Paleolithic; Kebaran in the Levant, Belbasi in the Antalya region, and Zarzian in the Zagros mountains. The chief technological invention is that of the microlithic composite tool. The presence of some microliths in the Baradostian and a tendency towards smaller tools in the late Levanto-Aurignacian strongly suggests that the Epi-Paleolithic cultures were not the result of the arrival of newcomers but represent regional developments from the preceding Upper Paleolithic. The most characteristic product of the Neolithic was painted pottery, in which was expressed a sense of individuality, artistry and abstraction lacking among many of the earlier, purely artifactual household assemblages [which came before]. 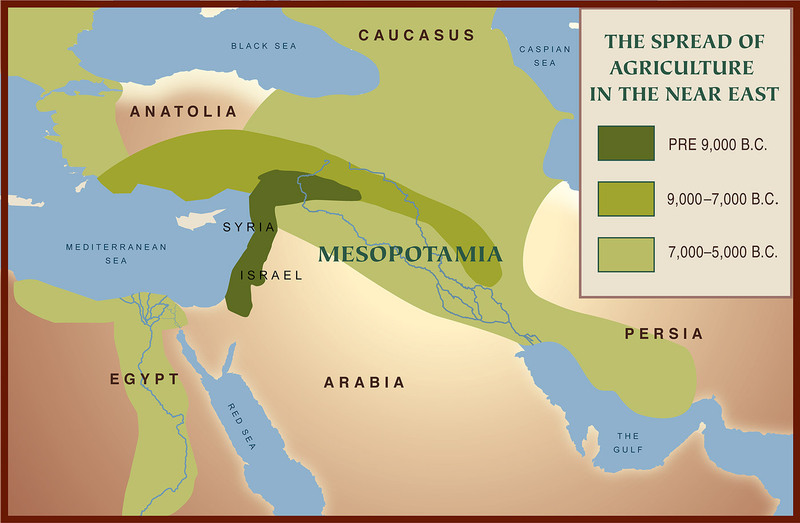 In the Neolithic period neither Egypt nor Mesopotamia had yet reached a position of cultural dominance over its neighbours. Urban civilization has predecessors to these two at sites like Jericho or Çatal Höyük, in Palestine and Anatolia, long regarded as backwaters. 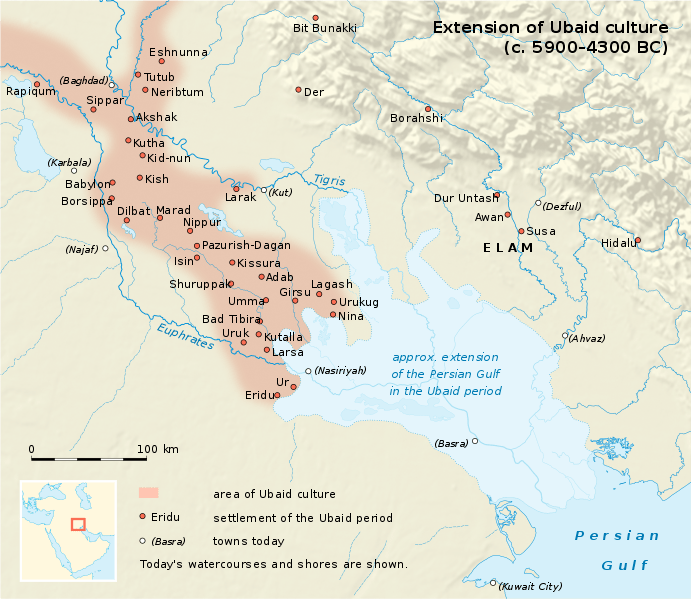 It has become abudantly clear that there was no area in the Near East during the Neolithic period that can claim an uninterrupted cultural development; cultures rise and fall. 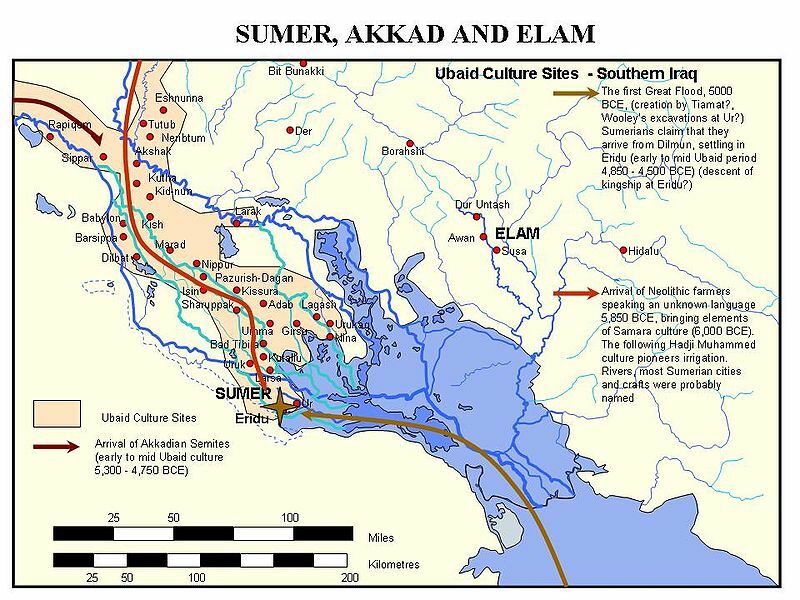 In Egypt and Sumer in dynastic times, as prehistory faded into dim history in the third millennium BC, new factors were at work: stronger political and economic control which ensured a stability of culture that could and did outlast political strife, foreign invasion, floods and disasters with greater success than had earlier cultures. Mousterian is a name given by archaeologists to a style of predominantly flint tools (or industry) associated primarily with Homo neanderthalensis and dating to the Middle Paleolithic, the middle part of the Old Stone Age. Mousterian tools that have been found in Europe were made by Neanderthals and date from between 300,000 BP and 30,000 BP (from Layer 2A dated 330 ± 5 ka, (OIS) 9 at Pradayrol, France). In Northern Africa and the Near East they were also produced by anatomically modern humans. In the Levant for example, assemblages produced by Neanderthals are indistinguishable from those produced by Qafzeh type modern humans. It may be an example of acculturation of modern humans by Neanderthals because the culture after 130,000 years reached the Levant from Europe (the first Mousterian industry appears there 200,000 BP) and the modern Qafzeh type humans appear in the Levant another 100,000 years later. Possible variants are Denticulate , Charentian (Ferrassie & Quina) named after the Charente region. Typical and the Acheulean Tradition (MTA) – Type-A and Type-B. The Industry was superseded by the Châtelperronian during 35,000-29,000 BP. 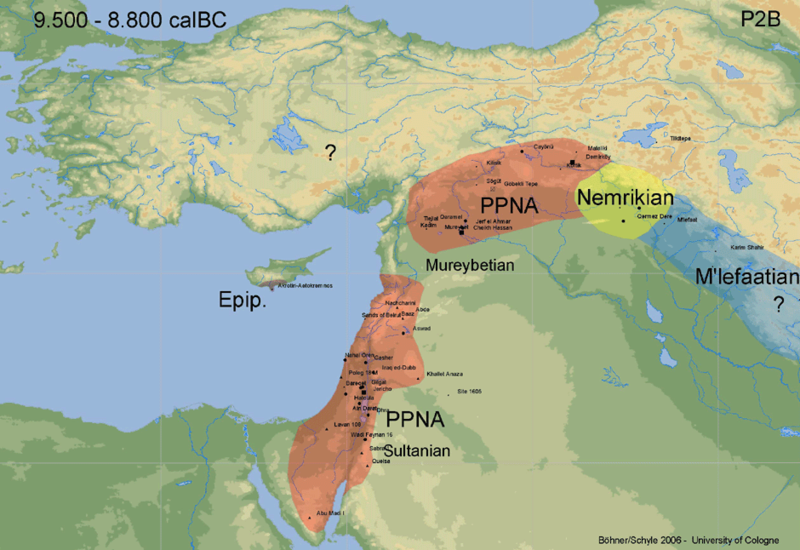 The Emirian culture represents the transition between the Middle Paleolithic and the Upper Paleolithic in the Levant (Syria, Lebanon, Palestine). It apparently developed from the local Mousterian without rupture, keeping numerous elements of the Levalloise-Mousterian, together with the locally typical (but not frequent) point known as Emireh point. There are also numerous stone blade tools, including some curved knives similar to those found in the Chatelperronian culture of Western Europe. The Emirian eventually evolved into the Upper Paleolithic Antelian culture in the Levant (Syria, Lebanon, Palestine), still of Levalloise tradition but with some Aurignacian influences. The most important innovation in this period is the incorporation of some typical elements of Aurignacian, like some types of burins and narrow blade points that resemble the European type of Font-Yves. 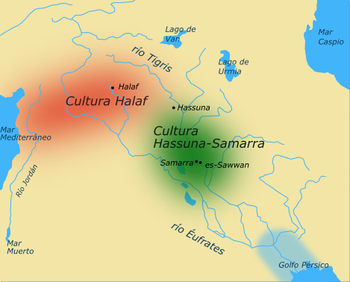 The Halfan culture (24,000–17,000 BC) flourished between 18,000 and 15,000 BC in Nubia and Egypt. One Halfan site dates to before 24,000 BC. They lived on a diet of large herd animals and the Khormusan tradition of fishing. Although there are only a few Halfan sites and they are small in size, there is a greater concentration of artifacts, indicating that this was not a people bound to seasonal wandering, but one that had settled, at least for a time. The Halfan is seen as the parent culture of the Ibero-Maurusian industry which spread across the Sahara and into Spain. Sometimes seen as a proto-Afro-Asiatic culture, this group is derived from the Nile River valley culture known as Halfan, dating to about 17,000 BC. 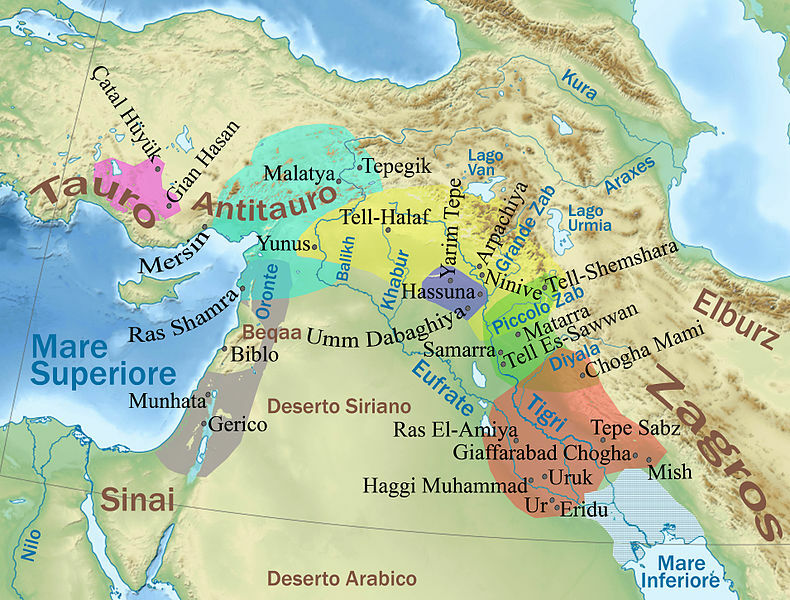 The Halfan culture was derived in turn from the Khormusan, which depended on specialized hunting, fishing, and collecting techniques for survival. The material remains of this culture are primarily stone tools, flakes, and a multitude of rock paintings. 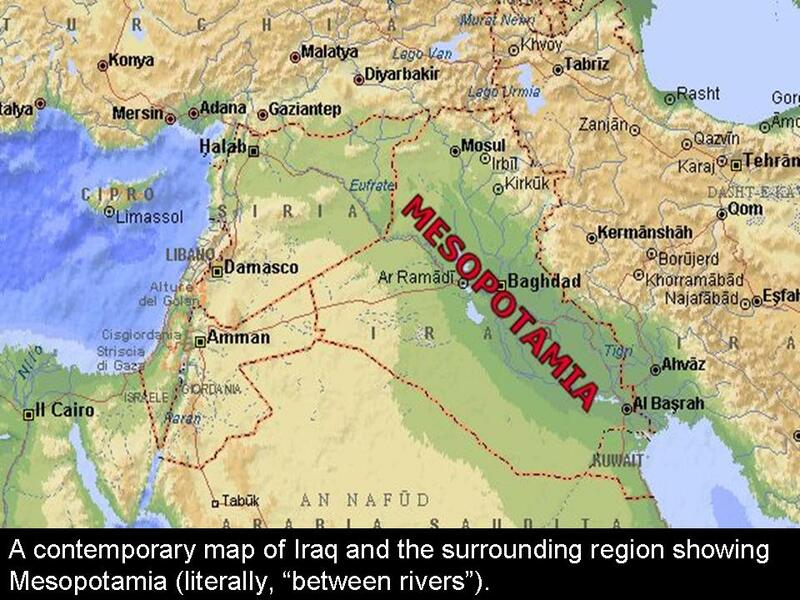 The end of the Khormusan came around 16,000 BC and was concurrent with the development of other cultures in the region, including the Gemaian. The Iberomaurusian culture is a backed bladelet industry found throughout the Maghreb. The industry was originally described in 1909 by the French scholar Pallary, at the site of Abri Mouillah. Other names for the industry have included “Mouillian” and “Oranian”. Recent fieldwork indicates that the culture existed in the region from around the timing of the Last Glacial Maximum (LGM), at 20,000 BP, until the Younger Dryas. The culture is succeeded by the Capsian, which was originally thought to have expanded into the Maghreb from the Near East, although later studies have indicated that the Iberomaurusian were the progenitors of the Capsian. 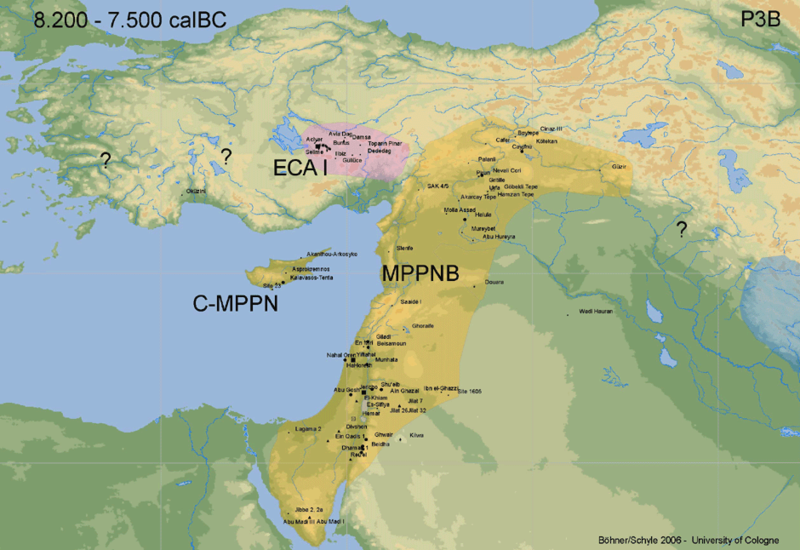 The Capsian culture (named after the town of Gafsa in Tunisia) was a Mesolithic culture of the Maghreb, which lasted from about 10,000 to 6,000 BCE. 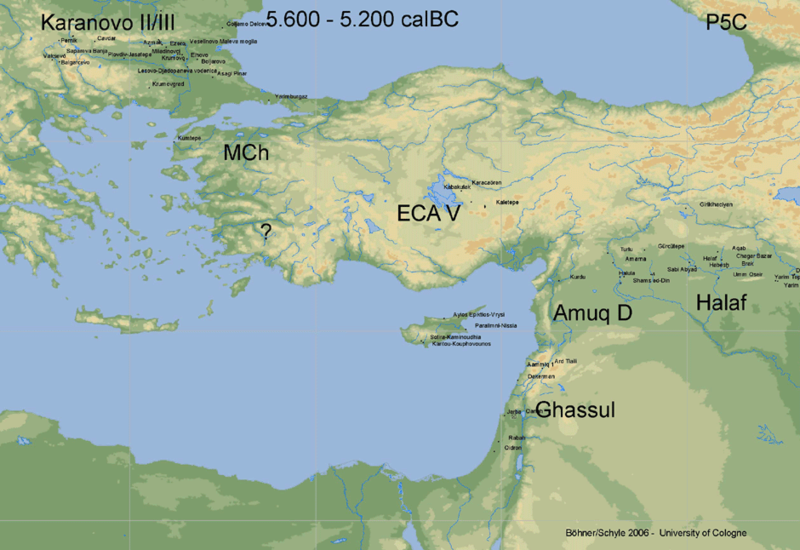 It was concentrated mainly in modern Tunisia, and Algeria, with some sites attested in southern Spain to Sicily. It is traditionally divided into two horizons, the Capsien typique (Typical Capsian) and the Capsien supérieur (Upper Capsian) which are sometimes found in chronostratigraphic sequence. They represent variants of one tradition, the differences between them being both typological and technological. During this period, the environment of the Maghreb was open savanna, much like modern East Africa, with Mediterranean forests at higher altitudes. The Capsian diet included a wide variety of animals, ranging from aurochs and hartebeest to hares and snails; there is little evidence concerning plants eaten. During the succeeding Neolithic of Capsian Tradition, there is evidence from one site, for domesticated, probably imported, ovicaprids. Anatomically, Capsian populations were modern Homo sapiens, traditionally classed into two “racial” types: Proto-Mediterranean and Mechta-Afalou on the basis of cranial morphology. Some have argued that they were immigrants from the east, whereas others argue for population continuity based on physical skeletal characteristics and other criteria, et cetera. Given its widespread occurrence in the Sahara, the Capsian culture is identified by some historical linguists as a possible ancestor of the speakers of modern Afroasiatic languages of North Africa which includes the Berber languages in North Africa. Nothing is known about Capsian religion, but their burial methods suggest a belief in an afterlife. Decorative art is widely found at their sites, including figurative and abstract rock art, and ocher is found coloring both tools and corpses. Ostrich eggshells were used to make beads and containers; seashells were used for necklaces. The Ibero-Maurusian practice of evulsion of the central incisors continued sporadically, but became rarer. The Eburran industry which dates between 13,000 and 9,000 BCE in East Africa, was formerly known as the “Kenya Capsian” due to similarities in the stone blade shapes. 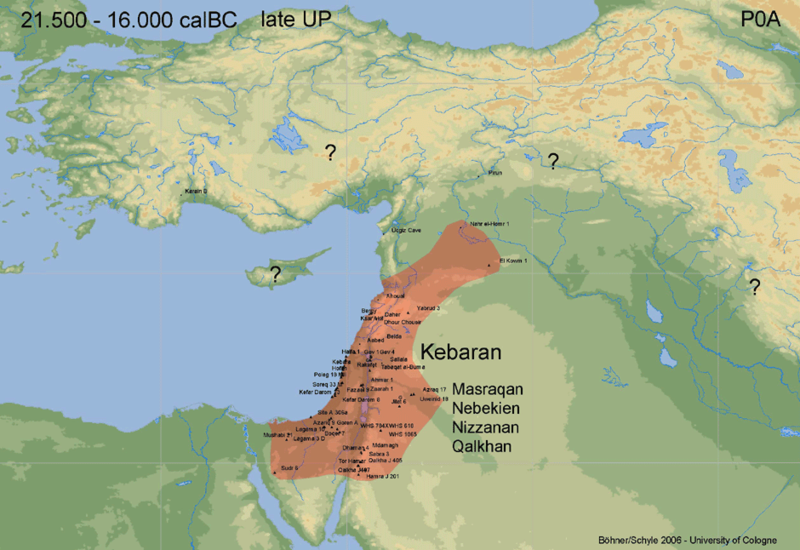 The Kebaran or Kebarian culture was an archaeological culture in the eastern Mediterranean area (c. 18,000 to 10,000 BC), named after its type site, Kebara Cave south of Haifa. It is preceded by the Athlitian phase of the Antelian and followed by the proto-agrarian Natufian culture of the Epipalaeolithic. The appearance of the Kebarian culture, of microlithic type implies a significant rupture in the cultural continuity of Levantine Upper Paleolithic. 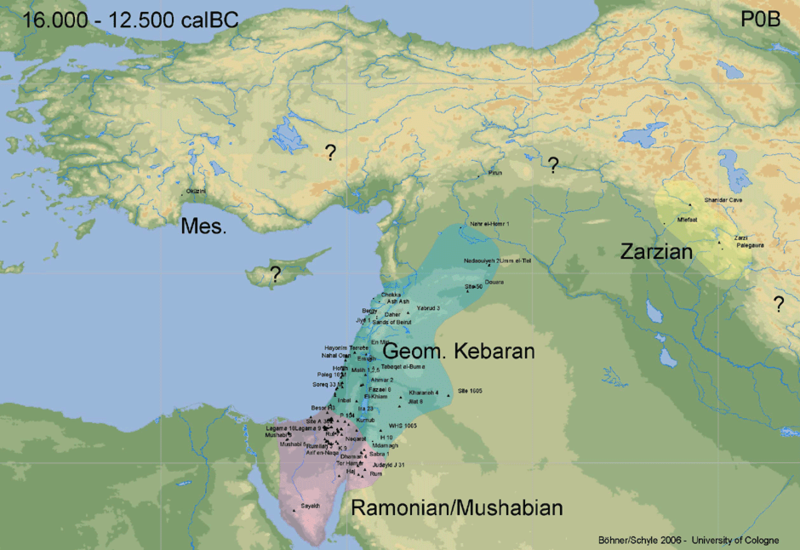 The Kebaran is the last Upper Paleolithic phase of the Levant (Syria, Jordan, Lebanon, Palestine). The Kebarans were characterized by small, geometric microliths, and were thought to lack the specialized grinders and pounders found in later Near Eastern cultures. The Kebaran were a highly mobile nomadic population, composed of hunters and gatherers in the Levant and Sinai areas who utilized microlithic tools. 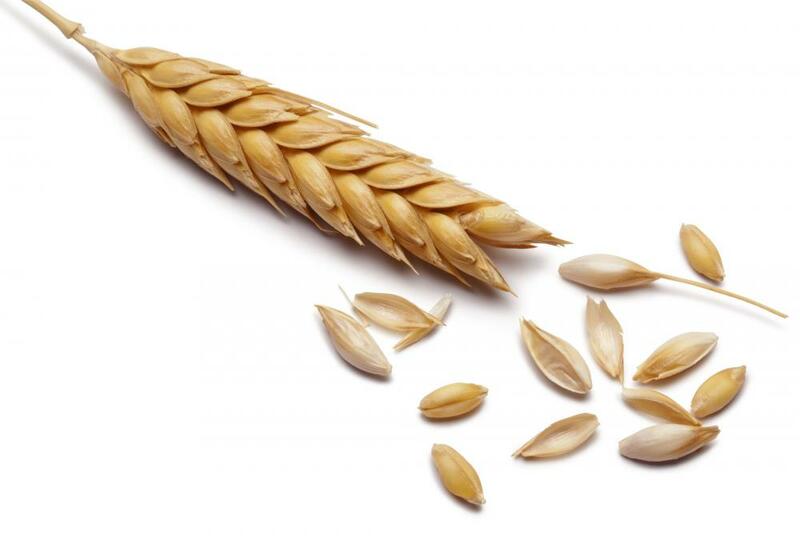 It is characterised by the earliest collecting of wild cereals, known due to the uncovering of grain grinding tools. It was the first step towards the Neolithic Revolution. The Kebaran people are believed to have practiced dispersal to upland environments in the summer, and aggregation in caves and rockshelters near lowland lakes in the winter. This diversity of environments may be the reason for the variety of tools found in their toolkits. Situated in the Terminal Pleistocene, the Kebaran is classified as an Epipalaeolithic society. 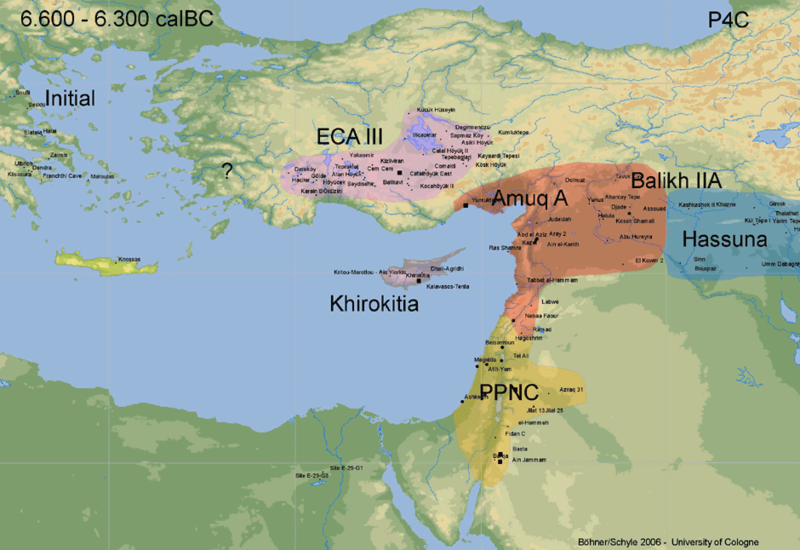 They are generally thought to have been ancestral to the later Natufian culture that occupied much of the same range. 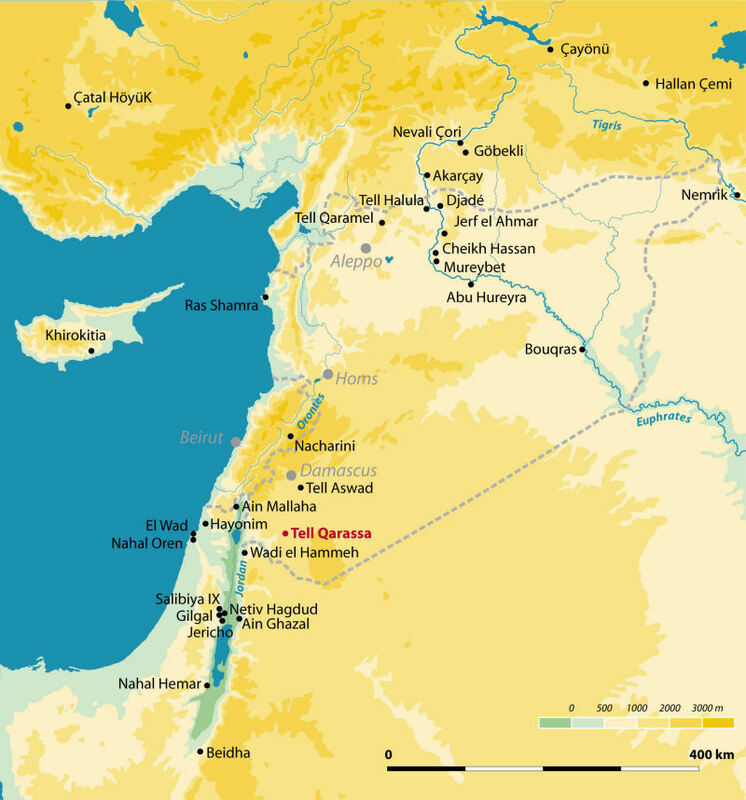 The term “Natufian” was coined by Dorothy Garrod who studied the Shuqba cave in Wadi an-Natuf, in the western Judean Mountains, about halfway between Tel Aviv and Ramallah. Radiocarbon dating places this culture from the terminal Pleistocene to the very beginning of the Holocene, from 12,500 to 9,500 BC. The Natufian culture was an Epipaleolithic culture that existed from 13,000 to 9,800 years ago in the Levant, a region in the Eastern Mediterranean. The period is commonly split into two subperiods: Early Natufian (12,500–10,800 BC) and Late Natufian (10,800–9500 BC). 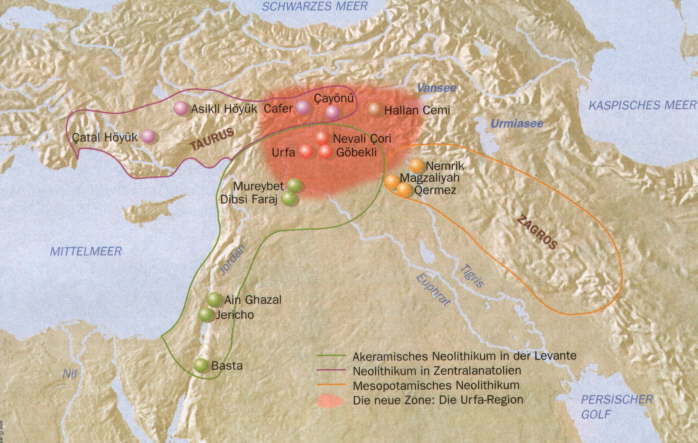 The Late Natufian most likely occurred in tandem with the Younger Dryas (10,800 to 9500 BC). 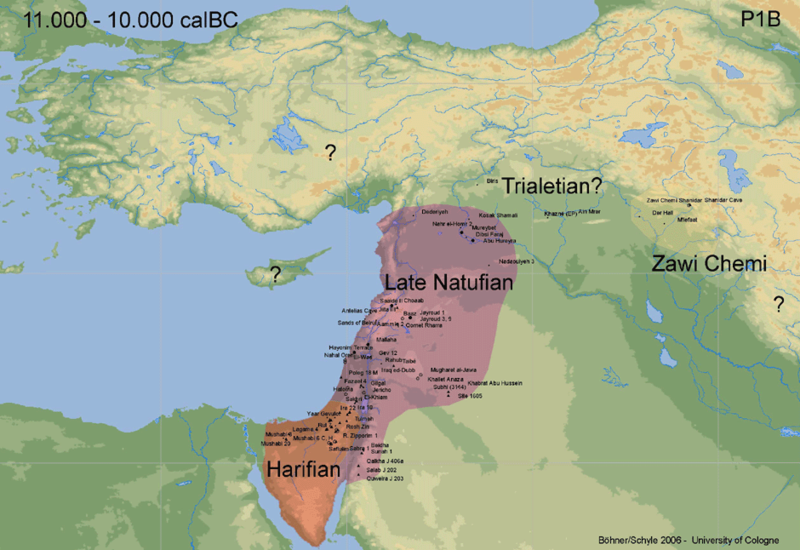 The Natufian culture was unusual in that it was sedentary, or semi-sedentary, before the introduction of agriculture. The Natufian communities are possibly the ancestors of the builders of the first Neolithic settlements of the region, which may have been the earliest in the world. There is some evidence for the deliberate cultivation of cereals, specifically rye, by the Natufian culture, at the Tell Abu Hureyra site, the site for earliest evidence of agriculture in the world. Generally, though, Natufians made use of wild cereals. Animals hunted included gazelles. In the Levant, there are more than a hundred kinds of cereals, fruits, nuts and other edible parts of plants, and the flora of the Levant during the Natufian period was not the dry, barren, and thorny landscape of today, but parkland and woodland. 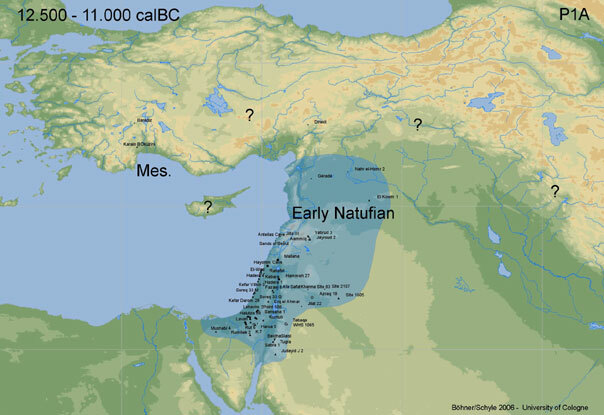 The Natufian developed in the same region as the earlier Kebaran complex, and is generally seen as a successor which developed from at least elements within that earlier culture. There were also other cultures in the region, such as the Mushabian culture of the Negev and Sinai, which are sometimes distinguished from the Kebaran, and sometimes also seen as having played a role in the development of the Natufian. More generally there has been discussion of the similarities of these cultures with those found in coastal North Africa. 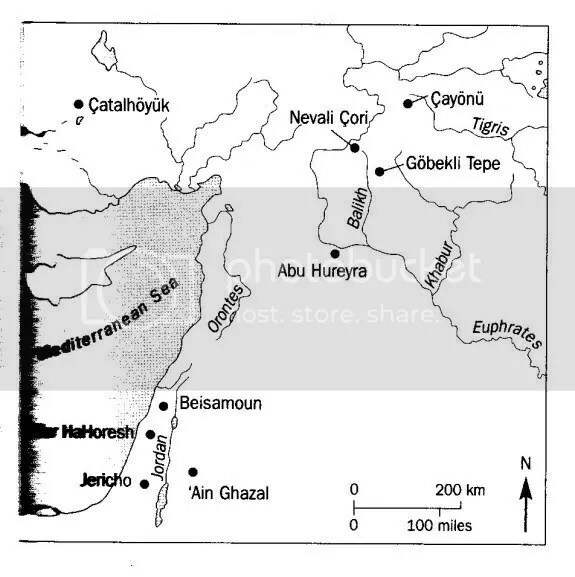 Graeme Barker notes there are: “similarities in the respective archaeological records of the Natufian culture of the Levant and of contemporary foragers in coastal North Africa across the late Pleistocene and early Holocene boundary”. Authors such as Christopher Ehret have built upon the little evidence available to develop scenarios of intensive usage of plants having built up first in North Africa, as a precursor to the development of true farming in the Fertile Crescent, but such suggestions are considered highly speculative until more North African archaeological evidence can be gathered. In fact, Weiss et al. have shown that the earliest known intensive usage of plants was in the Levant 23,000 years ago at the Ohalo II site. Anthropologist C. Loring Brace in a recent study on cranial metric traits however, was also able to identify a “clear link” to North African populations for early Natufians based on his observation of gross anatomical similarity with extant populations found mostly in the Sahara. Brace believes that these populations later became assimilated into the broader continuum of Southwest Asian populations. According to one theory, it was a sudden change in climate, the Younger Dryas event (ca. 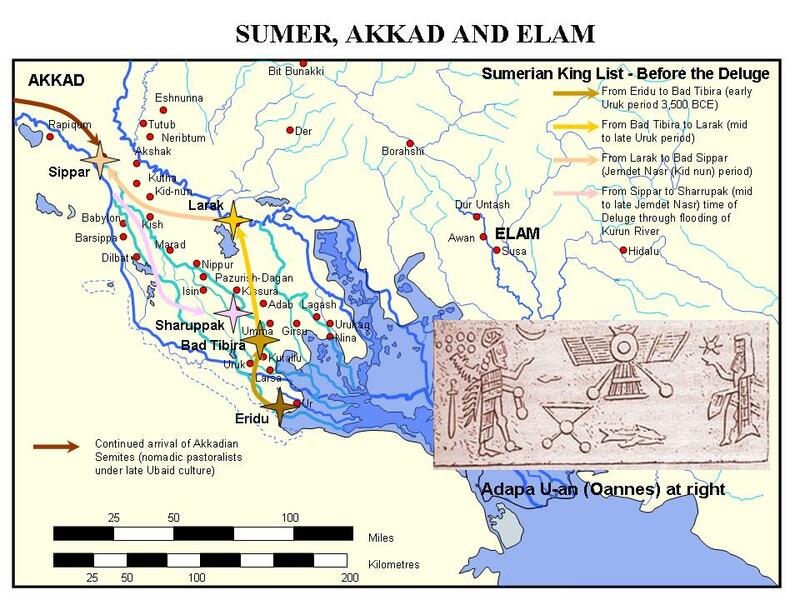 10800 to 9500 BC), that inspired the development of agriculture. The Younger Dryas was a 1,000-year-long interruption in the higher temperatures prevailing since the Last Glacial Maximum, which produced a sudden drought in the Levant. This would have endangered the wild cereals, which could no longer compete with dryland scrub, but upon which the population had become dependent to sustain a relatively large sedentary population. By artificially clearing scrub and planting seeds obtained from elsewhere, they began to practice agriculture. However, this theory of the origin of agriculture is controversial in the scientific community. It is at Natufian sites that some of the earliest archaeological evidence for the domestication of the dog is found. At the Natufian site of Ain Mallaha in Israel, dated to 12 000 BC, the remains of an elderly human and a four-to-five-month-old puppy were found buried together. At another Natufian site at the cave of Hayonim, humans were found buried with two canids. While the period involved makes it difficult to speculate on any language associated with the Natufian culture, linguists who believe it is possible to speculate this far back in time have written on this subject. 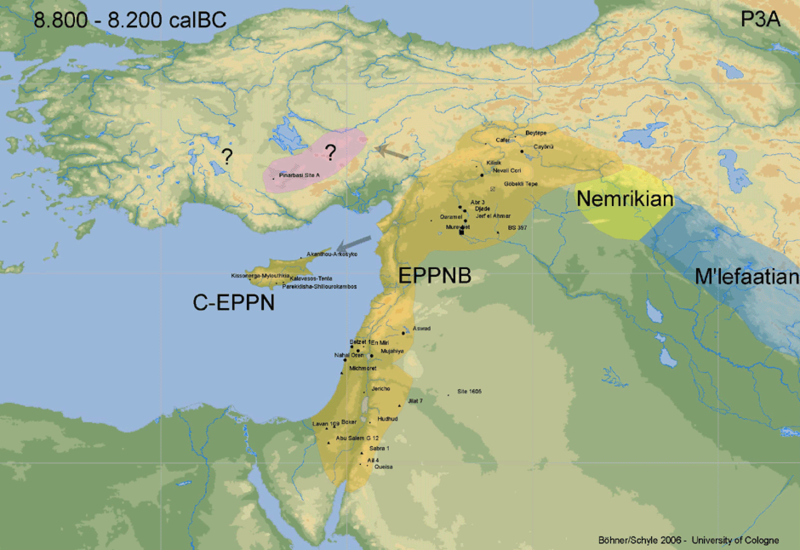 As with other Natufian subjects, opinions tend to either emphasize North African connections or Eurasian connections. Hence Alexander Militarev and others have argued that the Natufian may represent the culture which spoke Proto-Afroasiatic which he in turn believes has a Eurasian origin associated with the concept of Nostratic languages. Some scholars, for example Christopher Ehret, Roger Blench and others, contend that the Afroasiatic Urheimat is to be found in North or North East Africa, probably in the area of Egypt, the Sahara, Horn of Africa or Sudan Within this group, Christopher Ehret, who like Militarev believes Afroasiatic may already have been in existence in the Natufian period, would associate Natufians only with the Near Eastern pre-Proto-Semitic branch of Afroasiatic. Belbaşı is a cave/rock shelter and a late Paleolithic/Mesolithic site in southern Turkey, located southwest of Antalya. Belbaşı culture tool kit includes tanged arrowheads, triangular points and obliquely truncated blades. Belbaşı culture is a term sometimes used to describe the prehistoric culture whose clearly identifiable traces in the site were explored in the 1960s, as well as being sometimes used to include also the succeeding Mesolithic/proto-Neolithic culture of Beldibi Cave nearby, at only a few kilometers distance to the north; or, in a wider sense, to cover the entire sequence constituted by half a dozen caves west of Antalya, encompassing, in this sense, also the Neolithic sites at, from south to north, Çarkin, Öküzlü and Karain caves. Other sources may start the sequence at Beldibi, thus referring to a Beldibi culture, or treat each cave individually. Such a sequence from late Paleolithic to Neolithic in such closely located sites is unknown elsewhere. Beldibi culture further offers coloured rock engravings on the walls of the cave, hitherto the only known cave art in western Asia, as well as furniture art decorated with naturalistic forms and geometric ornament. Its phases contained imported obsidian, presumably from eastern Taurus Mountains or from the north of the River Gediz, and early forms of pottery. Bones of deer, ibex and cattle occur, and subsistence was likely assisted by coastal fishing from the very close Mediterranean Sea and by the gathering of wild grain. There is as yet no evidence of food production or herding. Belbaşı culture shows indications of an early connection to the Kebaran industry assemblages of Palestine. Their settlements were stable, typical of Natufian culture sites in this respect, and many later evolved into agricultural villages, similar to Jericho’s forerunner Tell es-Sultan, settled around 7800 BC. Since the proto-Neolithic of Beldibi being a development from the Mesolithic of Belbaşı is only a possibility, although a strong one, sources differ in their choice of terms for the cultures concerned. The lithic assemblage of both cultures were based upon microliths. 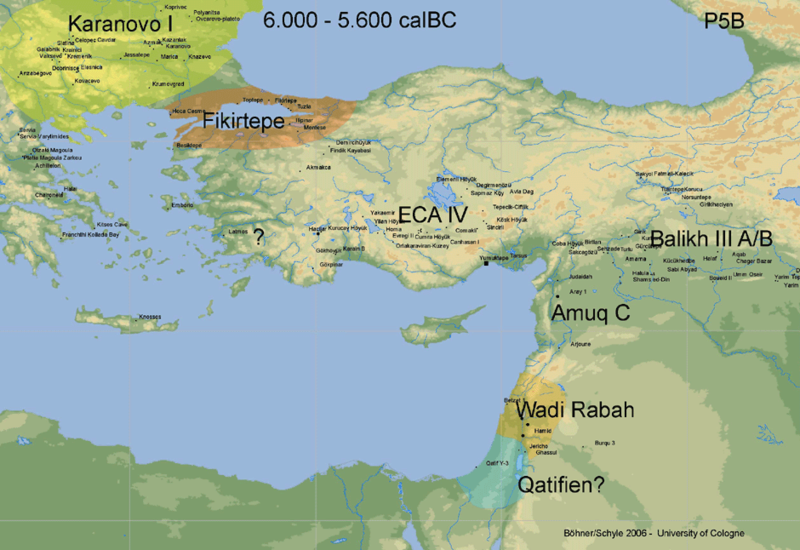 Their most lasting effect was felt not in the Near East, where they seem to have left no permanent mark on the cultural development of Anatolia after 5000 BC, but in Europe, for it was to this new continent that the neolithic cultures of Anatolia introduced the first beginnings of agriculture and stockbreeding. 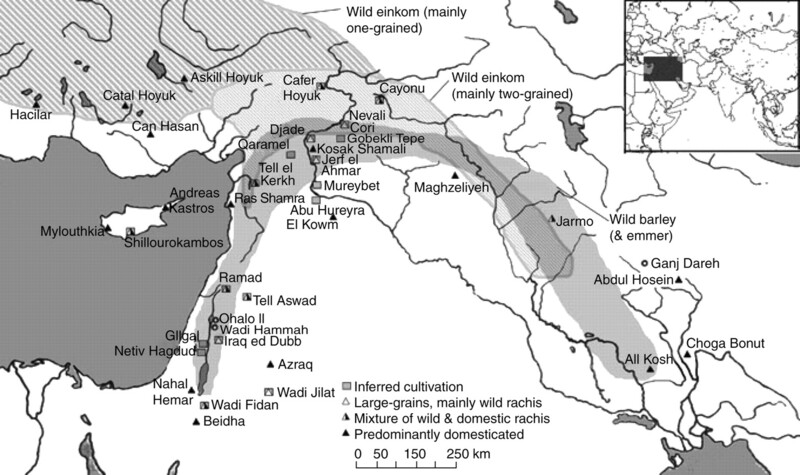 Evidence for human occupation of the Zagros reaches back into the Lower Palaeolithic, as evidenced by the discovery of many cave-sites dating to that period in the Iranian part of the mountain range. Middle Palaeolithic stone tool assemblages are known from Barda Balka, a cave-site south of the Little Zab; and from the Iranian Zagros. A Mousterian stone tool assemblage – produced by either Neanderthals or anatomically modern humans – was recently excavated in Arbil. Neanderthals also occupied the site of Shanidar. This cave-site, located in the Sapna Valley, has yielded a settlement sequence stretching from the Middle Palaeolithic up to the Epipalaeolithic period. The site is particularly well known for its Neanderthal burials. The Mousterian culture is followed by the Baradostian culture, which is an early Upper Palaeolithic flint industry culture in Zagros region at the border of Iran and Iraq. Radiocarbon dates suggest that this is one of the earliest Upper Palaeolithic complexes; it may have begun as early as 36000 BC. Its relationship to neighbouring industries however remains unclear. Shanidar Cave in Iraqi Kurdistan, Warwasi rockshelter and Yafteh cave at western Zagros and Eshkaft-e gavi Cave in southern Zagros are among the major sites to be excavated. Perhaps caused by the maximum cold of the last phase of the most recent ice age or Wurm glaciation the Baradostian was replaced by a local Epi-Palaeolithic industry called the Zarzian culture. This tool tradition marks the end of the Zagros Palaeolithic sequence. Zarzian culture of the Zagros mountains (12,400–8500 BC), stretching northwards into Kobistan in the Caucasus and eastwards into Iran, is an archaeological culture of late Paleolithic and Mesolithic in Iraq, Iran, Central Asia named and recognised of the cave of Zarzi in Iraqi Kurdistan. Here was found plenty of microliths (up to 20% finds). Their forms are short and asymmetric trapezoids, and triangles with hollows. The Zarzian of the Zagros region of Iran is contemporary with the Natufian, but different from it. The period of the culture is estimated about 18,000-8,000 years BC. 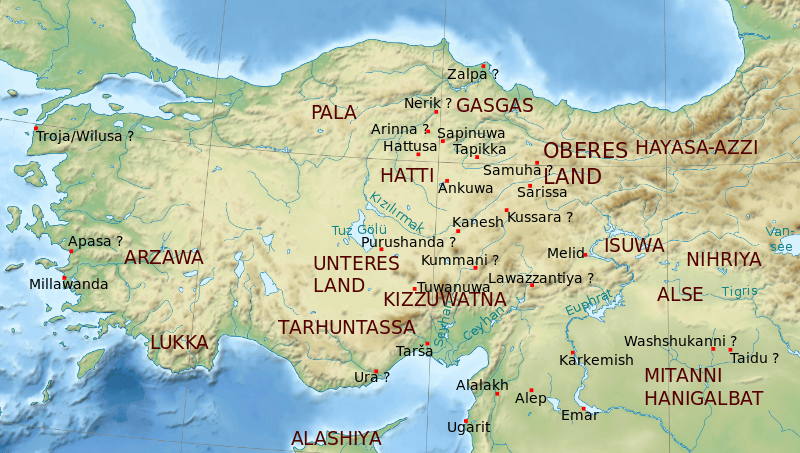 It was preceded by the Baradostian culture in the same region and was related to the Imereti culture of the Caucasus. The only dates for the entire Zarzian come from Palegawra Cave, and date to 17,300-17,000BP, but it is clear that it is broadly contemporary with the Levantine Kebaran, with which it shares features. It seems to have evolved from the Upper Palaeolithic Baradostian. There are only a few Zarzian sites and the area appears to have been quite sparsely populated during the Epipalaeolithic. Faunal remains from the Zarzian indicate that the temporary form of structures indicate a hunter-gatherer subsistence strategy, focused on onager, red deer and caprines. Better known sites include Palegawra Cave, Shanidar B2 and Zarzi. The Zarzian culture is found associated with remains of the domesticated dog and with the introduction of the bow and arrow. 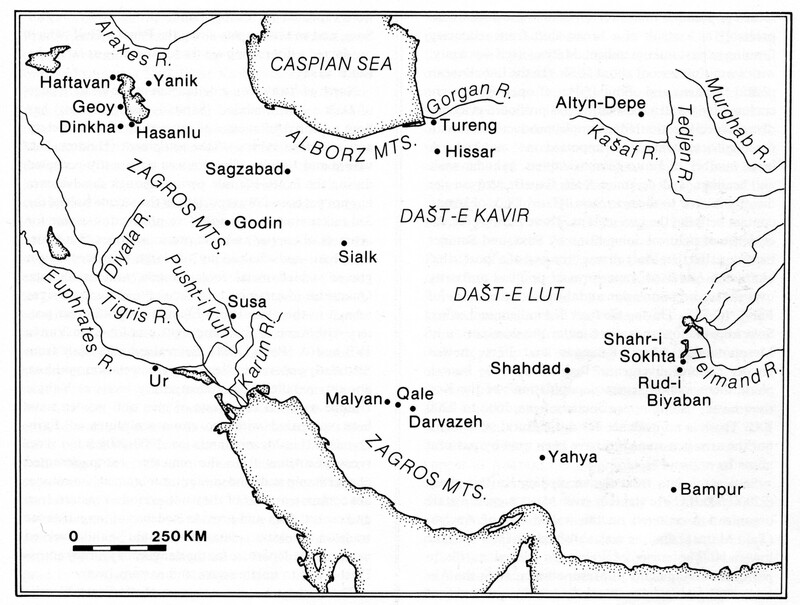 It seems to have extended north into the Kobistan region and into Eastern Iran as a forerunner of the Hissar and related cultures. The Zarzian culture seems to have participated in the early stages of what Kent Flannery has called the broad spectrum revolution (BSR). He suggested that the emergence of the Neolithic in southwest Asia was prefaced by increases in dietary breadth among foraging societies. It has been proposed that the broad spectrum revolution (BSR) of Kent Flannery (1969), associated with microliths, the use of the bow and arrow, and the domestication of the dog, all of which are associated with these cultures, may have been the cultural “motor” that led to their expansion. Certainly cultures which appeared at Franchthi Cave in the Aegean and Lepenski Vir in the Balkans, and the Murzak-Koba (9100–8000 BCE) and Grebenki (8500–7000 BCE) cultures of the Ukrainian steppe, all displayed these adaptations. 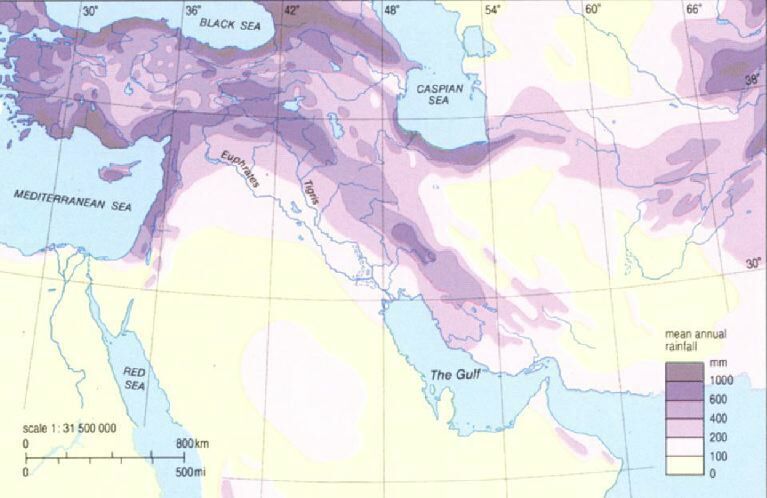 The broad spectrum revolution followed the ice age around 15,000 BP in the Middle East and 12,000 BP in Europe. During this time, there was a transition from focusing on a few main food sources to gathering/hunting a “broad spectrum” of plants and animals. Flannery’s hypothesis was meant to help explain the adoption of agriculture. Unpersuaded by “the facile explanation of prehistoric environmental change,” he suggested (following Lewis Binford’s equilibrium model) that population growth in optimal habitats led to demographic pressure within nearby marginal habitats as daughter groups migrated. The search for more food within these marginal habitats forced foragers to diversify the types of food sources harvested, broadening the subsistence base outward to include more fish, small game, water fowl, invertebrates likes snails and shellfish, as well as previously ignored or marginal plant sources. Most importantly, Flannery argues that the need for more food in these marginal environments led to the delibrate cultivation of certain plants species, especially cereals. In optimal habitats, these plants naturally grew in relatively dense stands, but required human intervention in order to be efficiently harvested in marginal zones. Thus, the broad spectrum revolution set the stage for domestication and rise of permanent agricultural settlement. A broad spectrum revolution is likely to manifest as both an increased spectrum of food resources and an evenness in the exploitation of high- and low-value prey. Under a broad spectrum economy a greater amount of low-value prey (i.e. high cost-to-benefit ratio) would be included because there are insufficient high-value prey to reliably satisfy a population’s needs. In terms of plants, it would be expected that foodstuff previously ignored because of the difficult in their extraction are now included in a diet. Whereas, animal prey which was previously considered an inefficient use of resources (particularly small, fast mammals or fish) may also be included. In the Middle East, the broad spectrum revolution led to an increase in the production of food. The growth and reproduction of certain plants and animals became vastly popular. Because large animals became quite scarce, people had to find new resources of food and tools elsewhere. Interests focused on smaller game like fish, rabbits, and shellfish because the reproduction rate on small animals is much greater than that of large animals. The most commonly accepted stimulation for the BSR is demographic pressures on the landscape, under which over-exploitation of resources meant narrows diets restricted to high-value prey could no longer feed the expanding population. The Broad Spectrum Revolution has also been linked to climatic changes, including sea level rises during which conditions became more inviting to marine life offshore in shallow, warm waters. Quantity and variety of marine life increased drastically as did the number of edible species. Because the rivers’ power weakened with rising waters, the currents flowing into the ocean were slow enough to allow salmon and other fish ascend upstream to spawn. Birds found refuge next to riverbeds in marsh grasses and then proceeded to migrate across Europe in the wintertime. The Middle East served as the source for many animals that could be domesticated, such as sheep, goats and pigs. This area was also the first region to domesticate the dromedary camel. Henri Fleisch discovered and termed the Shepherd Neolithic flint industry from the Bekaa Valley in Lebanon and suggested that it could have been used by the earliest nomadic shepherds. He dated this industry to the Epipaleolithic or Pre-Pottery Neolithic (PPN) as it is evidently not Paleolithic, Mesolithic or even Pottery Neolithic. The presence of these animals gave the region a large advantage in cultural and economic development. As the climate in the Middle East changed, and became drier, many of the farmers were forced to leave, taking their domesticated animals with them. It was this massive emigration from the Middle East that would later help distribute these animals to the rest of Afroeurasia. This emigration was mainly on an east-west axis of similar climates, as crops usually have a narrow optimal climatic range outside of which they cannot grow for reasons of light or rain changes. For instance, wheat does not normally grow in tropical climates, just like tropical crops such as bananas do not grow in colder climates. This East-West axis is the main reason why plant and animal domestication spread so quickly from the Fertile Crescent to the rest of Eurasia and North Africa, while it did not reach through the North-South axis of Africa to reach the Mediterranean climates of South Africa, where temperate crops were successfully imported by ships in the last 500 years. The African Zebu is a separate breed of cattle that was better suited to the hotter climates of central Africa than the fertile-crescent domesticated bovines. North and South America were similarly separated by the narrow tropical Isthmus of Panama, that prevented the llama to be exported from the Andes to the Mexican plateau. Up to 10 to 15 years ago, the first settled life for human beings in terms of animal feeding and agriculture, the so called “Neolithic Age” society, was being marked in history as B.C. 9500 by the archeology science and this was namely “Jericho” society, today known as “Tell es Sultan” in the “Levant” area. 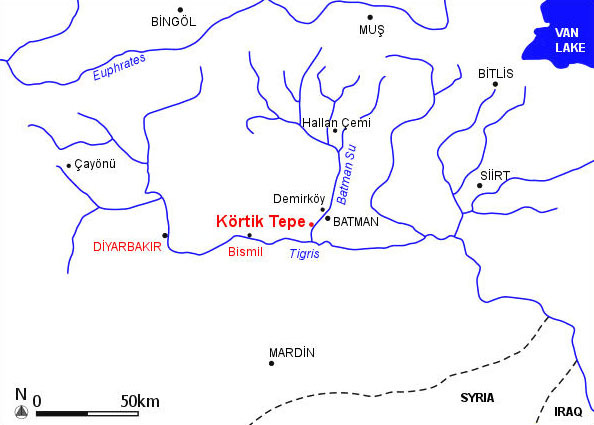 However, the researches of recent years in the upper “Mezopotomia” region of south-east Anatolia indicated that this marking in History shall be taken backwards and this era qualified by sociology and history as “Neolithic Revolution” for civilization is to begin around the cities of Urfa and Diyarbakır. The area of “Nevali Çori” which was excavated between 1963 and 1991 is unfortunately under dam waters today. However, by the help of the excavations held in the area, all the information about “Neolithic Age” obtained up to then have been invaluably enriched and it was revealed that in fact, “Neolithic Age” had taken place between B.C. 12000 and 10000 in this area. The existence of temple architecture founded on stone with floor tiling gives us important clues about the belief of the man of this era. The sculpture out of stone and the art of “KABARTMA” beautifying this architecture proves the importance of this area. With its architectural and cultural similarities to “Nevali Çori”, the other significant site in the Harran Plateau, “Göbekli Tepe” which is being excavated since 1995 is another strong evidence of the thesis set forward for the first time by the findings of the former. Initiated by these two sites, as a geographical area where the roots of the civilization are fertilized, south-east Anatolia has become a point of attraction for researchers from all over the world. When both sites are viewed in terms of sculpture findings, as a surprising result, male figures are in the majority and no evidence related to “Mother Goddess” the irreplacable figure for the Anatolian cultures has been traced. However, Professor Hauptmann set forward his views on this topic that, with the existing evidence, we cannot talk of worship on male Gods within the area. 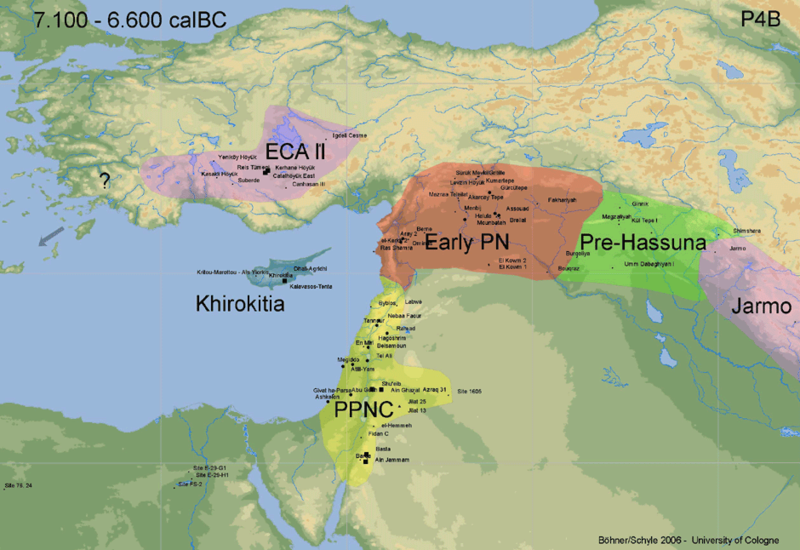 The Pre-Pottery Neolithic (PPN) (around 8,500-5,500 BCE) represents the early Neolithic in the Levantine and upper Mesopotamian region of the Fertile Crescent. It succeeds the Natufian culture of the Epipaleolithic (Mesolithic) as the domestication of plants and animals was in its beginnings and triggered by the Younger Dryas. The Pre-Pottery Neolithic is divided into Pre-Pottery Neolithic A (PPNA 8,500 BCE – 7,600 BCE) and the following Pre-Pottery Neolithic B (PPNB 7,600 BCE – 6,000 BCE). These were originally defined by Kathleen Kenyon in the type site of Jericho (Palestine). The Pre-Pottery Neolithic culture came to an end around the time of the 8.2 kiloyear event, a cool spell lasting several hundred years centred around 6200 BCE. The Pre-Pottery Neolithic precedes the ceramic Neolithic (Yarmukian). At ‘Ain Ghazal in Jordan the culture continued a few more centuries as the so-called Pre-Pottery Neolithic C culture. 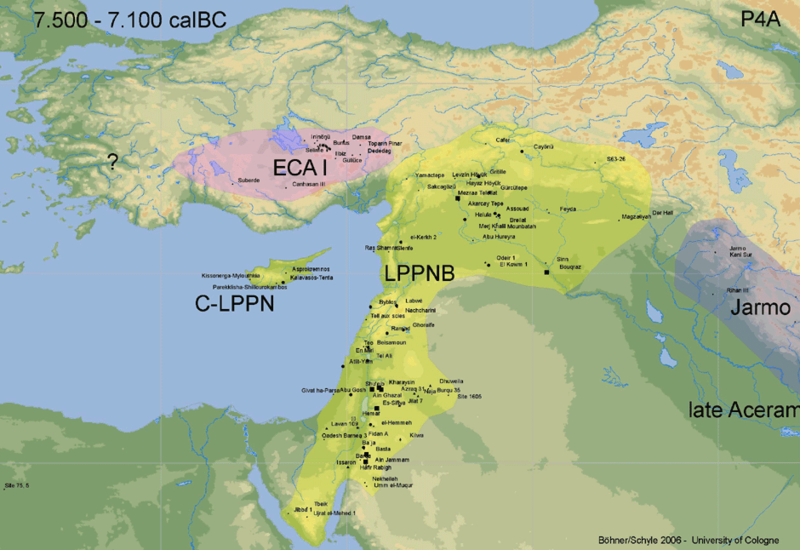 Around 8,000 BCE during the Pre-Pottery Neolithic A (PPNA) the world’s first town Jericho appeared in the Levant. Pre-Pottery Neolithic B (PPNB) differed from PPNA in showing greater use of domesticated animals, a different set of tools, and new architectural styles. Work at the site of ‘Ain Ghazal in Jordan has indicated a later Pre-Pottery Neolithic C (PPNC) period which lasted between 8200 and 7900 BP. 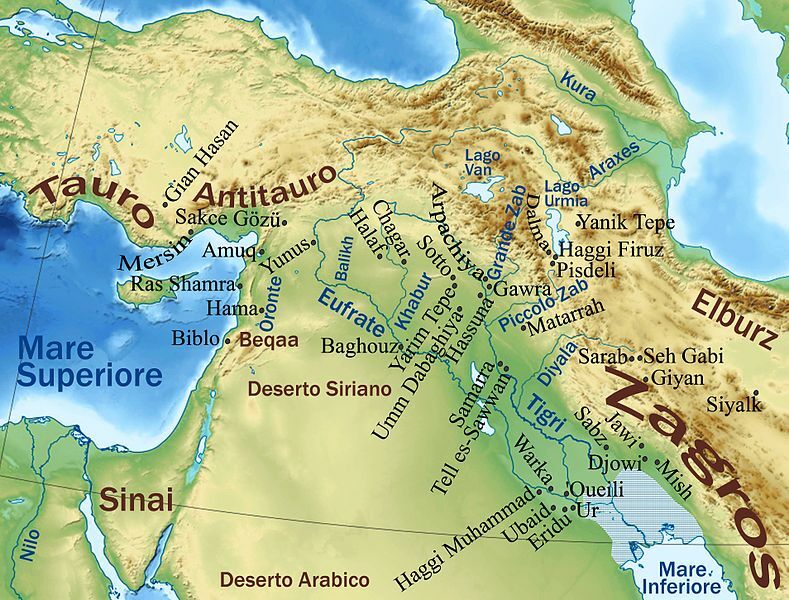 Juris Zarins has proposed that a Circum Arabian Nomadic Pastoral Complex developed in the period from the climatic crisis of 6,200 BCE, partly as a result of an increasing emphasis in PPNB cultures upon animal domesticates, and a fusion with Harifian hunter gatherers in the Southern Levant, with affiliate connections with the cultures of Fayyum and the Eastern Desert of Egypt. 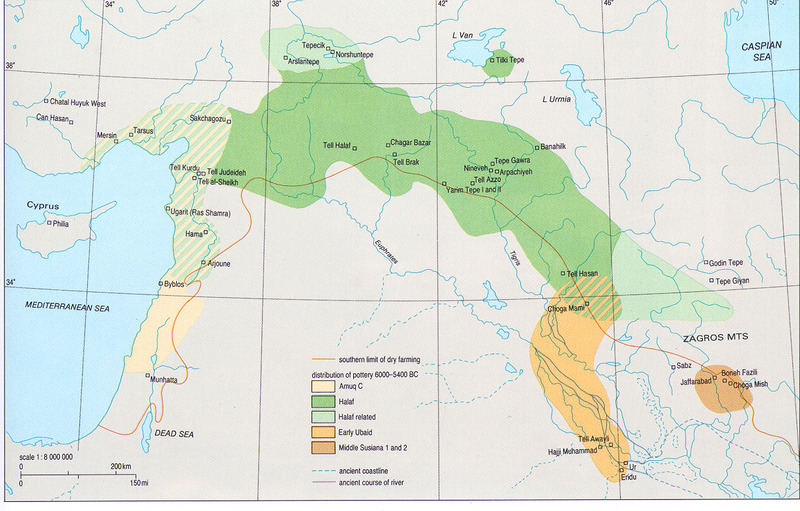 Cultures practicing this lifestyle spread down the Red Sea shoreline and moved east from Syria into Southern Iraq. Neolithic Mandala, a large polymer clay ornament I made illustrating Neolithic European life cycle symbols. Central Asia and a representation of the major courses of the ‘Silk Roads’, indicating the pivotal western region.